Having a backup iron sight (BUIS) will come in handy when things go wrong with your primary optic. Knowing that you have one equipped will save you a lot of time, money, and even headaches as you use your AR for hunting or competing. Let's take a look at which BUIS is perfect for your primary needs. Do you want a sight that is already mounted on your gun? Or do you want one that is ready for action the second you press a button? Regardless, time is a factor when it comes to using a backup sight. With a fixed iron sight, it’s already there and ready to use when you want it. A folded sight may come in handy when it’s needed and can be rapidly deployed in one touch. Some are perfect if you install them on something like a Picatinny rail. Some others may be ideal for something else like a Weaver rail. It’s important to know which rail your gun has before choosing a product that’s right for you. Co-witnessing is when your primary sight and your BUIS work together. A proper co-witness, for example, is when a red dot sight should be resting on top of the front sight of your BUIS. This will give you a double verification of where your shot will end up once you start pulling the trigger. Below are some of the best BUIS available for the year. Each one is considered the best in terms of a specified category (i.e.--Best BUIS for long-range weapons). We will be looking at five top-rated BUIS. We will go over each feature and include some of the good and bad things about each product. 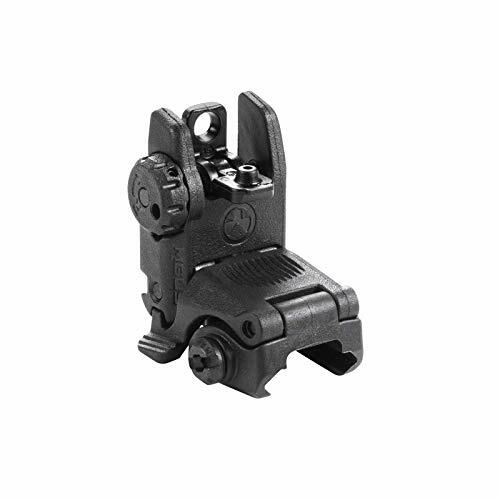 The Ozark Armament Flip Up Backup Sight is made from milled aluminum and is a front and rear sight that is spring loaded for rapid deployment. It is fully adjustable for when you are in higher elevations or if windy conditions are favorable for rerouting the trajectory of your shot. For the price you pay, you can't go wrong with this product. This is the perfect item for your AR as it will stay in place no matter how many rounds you fire. In case your primary optic doesn't work properly, there's a good chance that you'll need a sight that can pop up in the quickest amount of time possible. 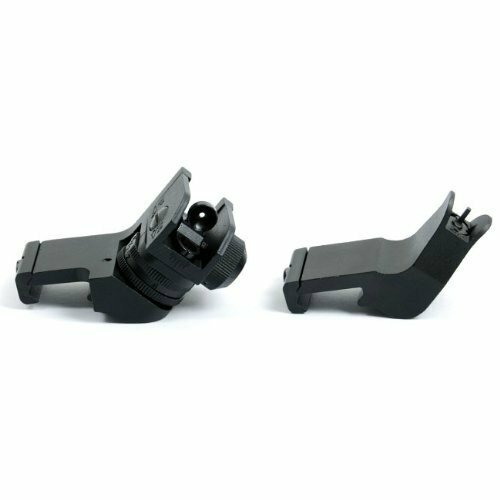 On both the front and rear sights, they are each equipped with precision and CQB Apertures. This is a really good choice if you’re looking for a BUIS that can co-witness with your primary AR optics. You can never go wrong with a product that will ensure that you get the best aim and in turn, the best shot. There are two types of Magpul MBS Flip-up Backup Sights available. One for the front and the other from the back. However, they are sold separately. This product is made from impact-resistant polymer that is lightweight and resists operational abuse. It's spring-loaded, so it will rapidly deploy at the press of a button should your gun’s primary sights fail. This product stays erect thanks to the detent and spring pressure and allows for unobstructed folding under impact. This product goes perfectly with military standard 1913s or Picatinny/STANAG 4694 railed hand guard. It comes with protective wings that shield the spring-locked A2 front sight post. You can also easily adjust it for windage. This is a low profile sight, so when you close it after use, it will close smoothly and won't snag. If you want a product that can take some serious damage, the Magpul won't disappoint. 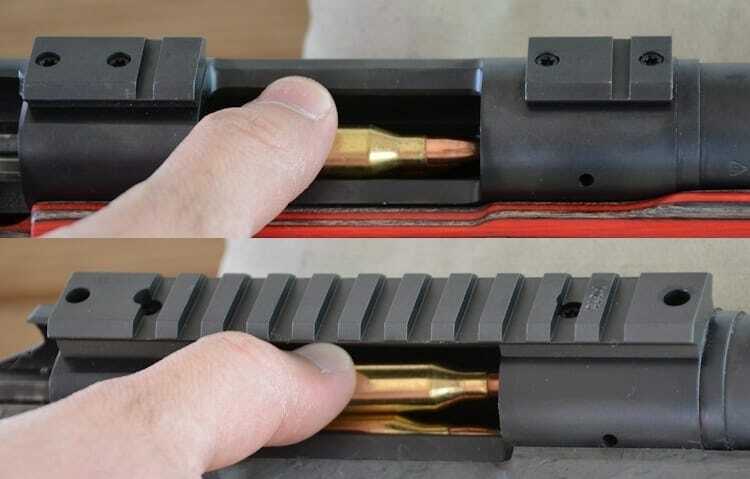 This sight, however, should not be used if your gun has a railed gas block. This can be due to excess heat issues that may cause problems for your gun. This is an ideal item for same plane guns. Made of Aluminum That is Proven to Be Lightweight and Durable. The DD Dagger Defense Flip Up BUIS is a tactical Picatinny rail-mounted sight. It is made from an aluminum alloy and is spring-loaded to ensure rapid deployment. If your gun has a Picatinny rail system, this is a perfect fit. This is folded flat, so it won't obstruct your view while you are firing your weapon. This is perfect to use along with red dots and holographic scopes and sights. It was made by a veteran-owned company. Former military members know that when it comes to firearms, every gun owner wants one that can shoot straight. And in doing so, they've created a BUIS that will make sure the shooting stays straight even when their primary sights don't get the job done. The product is easy to use and calibrate to your desired level of aim. If you want a device that’s easy to clean, the DD Tactical Flip might be your best choice. If your primary sight optics are red dots, then it will have no problem co-witnessing with the Dagger Defense. If you use a Picatinny rail system and don’t know which product is best for your exact rail, this one might be for you since it will fit in with almost all of them. This BUIS is made from lightweight and extremely durable 7075 aluminum, making it one of the most durable BUIS on the market. This is an ambidextrous product that can be securely mounted to Picatinny rails using a flathead screwdriver. It is offset from center by about 45 degrees. This offset makes the transition from optical to iron sights much easier so you can stay locked onto your target regardless if the primary option fails or not. With the Ade Advanced, you won't need to worry about it obstructing your vision or blocking your primary optical sight. If you're looking for something that will help keep your edge when you're switching between your primary and backup sights, the Ade Advanced might be the most reliable product you'll ever own. Smooth, quick transitions are what makes the difference between winning and losing a competition. It's even more important if you ever find yourself in a gunfight. The low profile extends only .2" above the top rail. The Ade Advanced is one of the most durable sights on the market. If you want one that is made from high-quality material and is designed to last you a while, choose this. Even with a few slight adjustments, this is a device that can guarantee you’ll hit your target dead-on every time you shoot. The final BUIS on our list is the Tacticon Armament Flip-up. Tacticon is a veteran-owned company that prides itself in making the most durable and best-built BUIS on the market. If you're looking for a device that comes with its own adjustment tool, you'll be glad to know that the Tacticon has just that. Typically, a stand-alone adjustment tool will run about $10, so you save yourself time and money in the process. It comes stored in a wooden case that is also perfect for storing some of your gun's extra ammo. With a push of a button, this sight will pop up with ease. You can never go wrong with an iron sight that can deploy at a moment’s notice, especially in situations when your primary option won’t work. If you want a product that is versatile and can fit on any gun, the Tacticon might just be the one you want. It can fit guns that have either a Picatinny Rail or a Weaver Rail, whether a hunting rifle or tactical rifle, it doesn’t matter. While Tacticon guarantees that this item can last a long time, it comes backed by a lifetime warranty. The front sight is fully adjustable for elevation while the back sight is fully adjustable for windage. If you want a product you can use for just about any gun, your best bet may be the Tacticon. It can be so good you might get another one for all the other guns you use. The wooden box that comes with this product is a unique feature compared to the others in this review. At the same time, the addition of tools makes things very convenient. 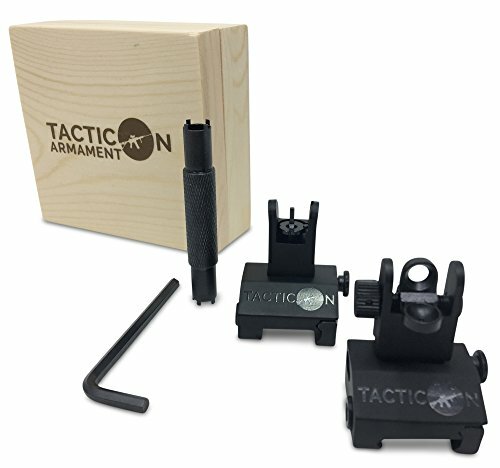 If you’re the kind of gun owner that wants to kill two birds with one stone and get a sight along with the tools to set it up in one package, the Tacticon will not disappoint. 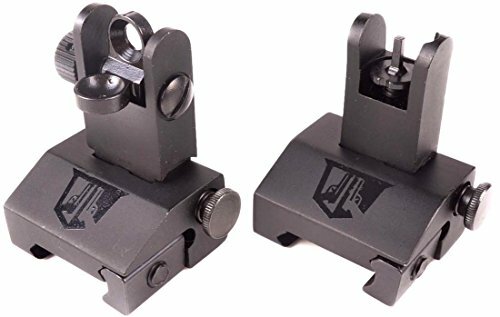 Are Backup Iron Sights Really Needed? The long answer: A backup iron sight is a must-have in the event your primary sights don’t work according to plan. When you’re hunting or competing, not knowing what or where you’re aiming may throw you off. At the same time, a poor shot can also cost you, especially when you are in competition rounds. One of the major pros of having a backup iron sight is that most of them come loaded with springs. With a press of a button, you can rapidly deploy your iron sight without ever having to lose your aim. One major con is that the product you choose may depend on the design. Some may not deploy as quickly as others and you may need to apply a little more pressure than normal to ensure that it is deployed properly. With these, the front sight is about ¼-inch higher than the rear sight aperture. These are only for mounting on gas blocks that are lower than the upper receiver. These are best known as “rail-mount sights”. These are made so that the front sight is the same height as the rear aperture when it’s placed on a flat surface. This type must be mounted somewhere at the same height as the upper receiver. This type is installed to stay in place. These are your "set it and forget it" kinds of product. And these are virtually indestructible. Folded sights are the ones that pop up with one press of a button. 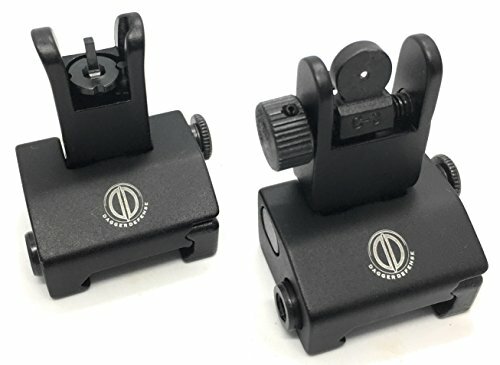 These are perfect for when you want to rapidly deploy your backup sight the second your primary sights fail. While folded down, they should remain smooth and not obstruct your vision. Having a backup iron sight is vital. While your primary sights are usually reliable, things can go wrong in an instant. A faulty product can lead to a missed opportunity at large game or cause poor performance in a shooting competition. Don't let optic failure be the end of all for your gun. Get a reliable backup iron sight so you feel confident in knowing you have a backup ready while keeping your aim steady.